Ted Muehling's collaboration with E.R. Butler & Co. brings to fruition a project that developed over a number of years. Intrigued by the classic but delicate shape of a Biedermeier candlestick found at a flea market, and impressed by the precision of nineteenth-century lathe work, Muehling set forth on his own version, whilst staying true to these qualities using traditional spinning and casting techniques. The cost and labor required to realize them, Muehling kept the pieces as prototypes. Ten years after seeing Ted's pieces, Rhett Butler suggested that Muehling try a technology which he used to produce his exquisite hardware. Butler's computerized lathes have given life to the designs. This process allows for precise control of the beautiful curves that make these pieces so elegant. The candlesticks are based on three basic shapes: the egg, an attenuated rod, and a trumpet form. Permutations of these convex and concave shapes have yielded 5 different pieces. 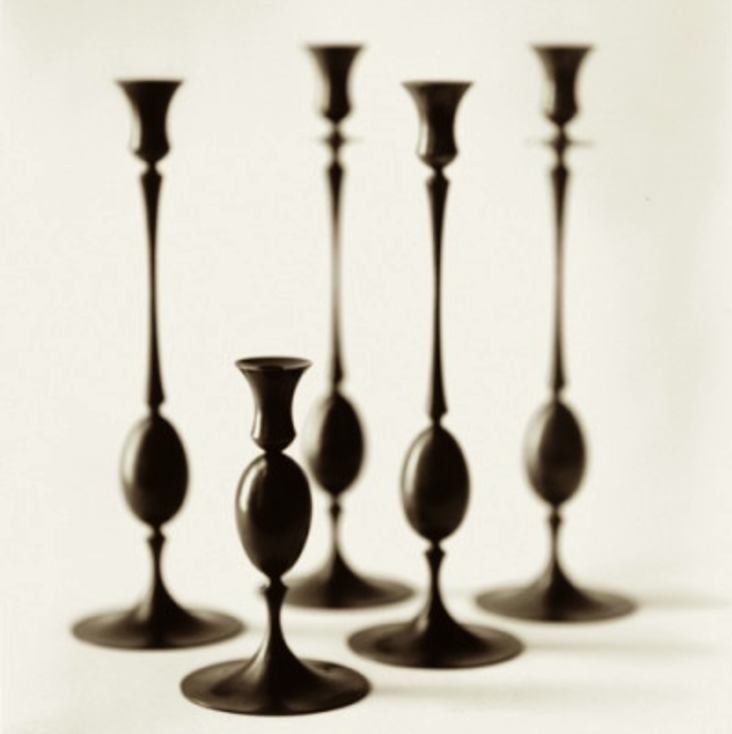 By combining and varying these, Muehling has created 17 different candlesticks that can be used individually, in symmetrical pairs, or in groupings of three or more. They are available in oxidized bronze, gold or sterling silver plate. The darkened bronze accentuates the silhouette, emphasizing a neoclassical origin, while polished or pumiced silver or gold enhances the play of light on the forms. Please contact us for availability and pricing or shop for leiva jewelry on our sister website- Swoon.